Not every woman should wear eyeliner. And every woman who does should be sure it is applied correctly or this one product could rob all the attention from her beauty. If the eye is the window of the soul, eyeliner often is the curtain that regulates wether you are seen for who you are or not. This is especially true for the Ingénue, whose beauty is youthful and innocent, and the Romantic, whose femininity is too strong for heavy eyeliner; it is simply too harsh for either of them and makes them appear to be striving for beauty that they already have. If you are an Ingénue or a Romantic, I recommend giving away your eyeliner and focusing on your mascara instead. For those adamant about lining their eyes, try using a eye shadow to do this; it is a much softer, more appealing look on your soft, sweet beauty. The sporty Naturals are not often favored by eyeliner either; it tends to make them look a bit awkward since it competes with their simple and inviting beauty. Most Naturals seldom want to wear makeup anyway, so if you are a Natural beauty, you may find my advice not to wear it to be liberating. 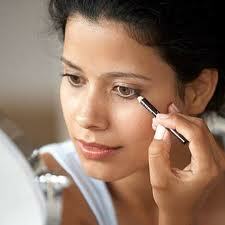 Classics and Gamins may find that eyeliner is a great asset for their image if applied simply and correctly. Those of the Summer and Autumn coloring will agree with me most, since lining they eye brings so much more life to their face and attention to who they are. If you are a Classic or a Gamin, be sure your choice of color and application is not too strong, or it too will challenge your beauty. Do not use black eyeliner (although a Winter Gamin can get away with black), find a softer color within your seasonal pallet, or try using eye shadow with a fine, angled brush. It is the Dramatics who should really focus on this product since she looks most stunning in a full makeover. If you have ever loved the look of heavy eye liner, it was probably on a Dramatic, since she is the one who can carry it off well and not look unapproachable. This Img.ID tends to love fashion and makeup and seldom needs advice on how to wear it since she is usually experimenting on her own, but quite often I find Dramatics who are afraid to try what they have seen on other Img.IDs as “too much.” I think sometimes she doesn’t understand how influential she is, and she wants to quite down her beauty so others are more comfortable around her. If you are a Dramatic who has not given eyeliner a try, break out your wings! You were designed for drama and excitement, let your image show who you are; heavy makeup is not too much on you. No matter which Img.ID you are, find the look that you are comfortable with and wear it with confidence. Keep in mind that eyeliner can make or break your femininity. If it squelches your approachability, avoid it or soften it up; if it brings life to who you are, wear it with pride, and be sure that you are the one approaching others to make them feel comfortable around you. Choose a color within your seasonal pallet. Choose liquid, gel or infallible liner for heavy application; powder or pencil for light application. Use quality tools (brushes, sharp pencil, etc) to be sure the line you draw is smooth, clean and precise. No-liner is better than dashed-liner. Accentuate the lash line; do not apply liner to the waterline (rim) of the eyelid, this is unhealthy, unattractive, unsustainable and only makes the eye appear smaller. Average eye should accentuate the outer corner, bringing the upper and lower lash lines together with a sideways v.
Narrow set eyes should only line the outer corner of eyelids, fading the line at the middle to inner lash line. Wide set eyes can be lined completely (if Img.ID appropriate). Deep set eyes should use light colors to draw them out illusionally. Bulging eyes should use darker colors to create depth illusionally. Have fun experimenting! Next week we will discuss eye shadow. Talk with you then.